Parents, teachers, and students came together to unite against common core (and so much more). After, the tour travels a few blocks to the Times Union Center. 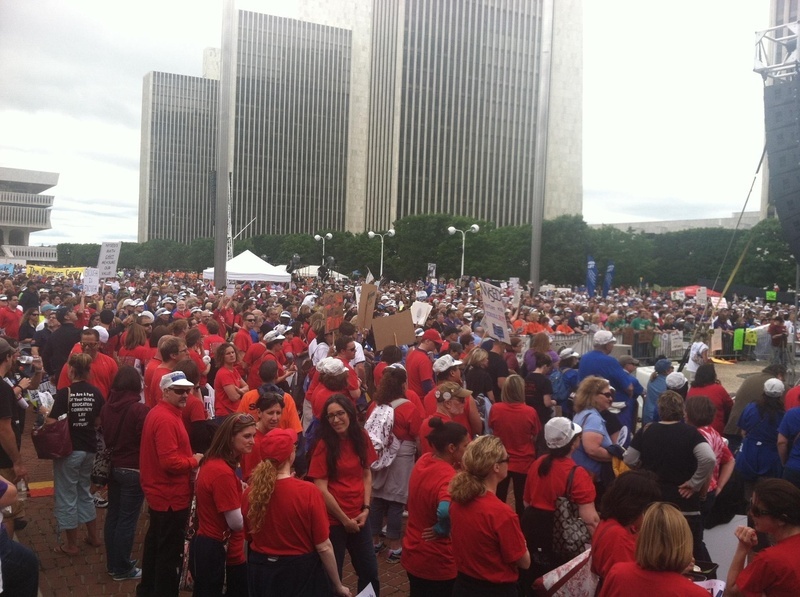 On June 8, 2013, parents, teachers, and students gathered in favor of NYSUT at a protest called “One Voice United.” They protested common core testing and data-collection in schools which were criticized as being corrupt. The NYSUT is a group of school, college, and health care employees, both retired and active, in affiliation with the American Federation of Teachers (NYSUT, 2013). Their goal is to improve the working conditions and education programs in New York State. In total, there are about 140,000 members, state wide. Protesters were also upset with the new system for taking away teacher’s ability to be individual. They said that this ultimately is hurting the student with public money (NYSUT, 2013). The Common Core program was instated in states around the country. According to New York State Education Department, the Common Core was adopted in July of 2010 to be implemented between the 2014/15 school year. It was a new way of testing for Math and English Language Arts. There was no required curriculum, instead it had “curriculum models” which teachers could yes. It was implemented for every student (NYSED, 2011). Washington Post author, Valerie Strauss, disputes the facts from the “myths” of the Common Core. She writes that the tests will cost the states who implement it more than previous testing. In addition, the same manufacturers of the tests will be used, which she says will create more of the same mistakes and problems seen in previous tests. Above all, she says that it is a huge myth that all students will be helped through this program. She writes, “The new tests could put students with disabilities and English-language learners at risk.” She also warns that students that need these accommodations may be overlooked in the long run (Strauss, 2013). Featured in these pictures are a general view of the rally and Kathleen (Kate) and Abby Reid. Kate Reid was, and still is, a high school resource room teacher. Abby Reid was 12 years old at the time. She is still currently excelling as a student at Pawling High School (Reid, 2016). 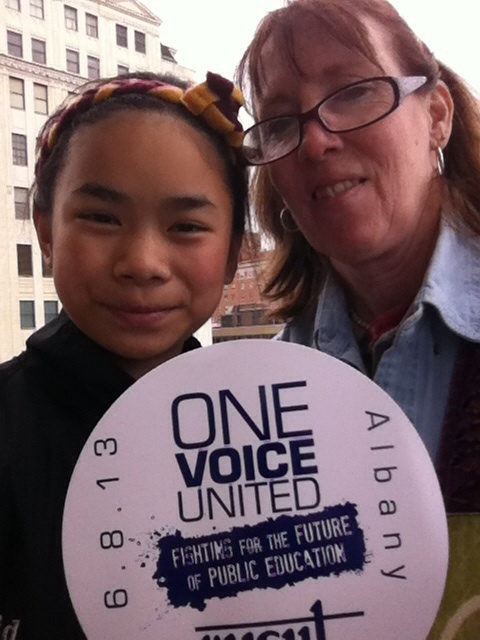 “One Voice United,” Albany Walks for Health, accessed April 20, 2019, http://www.albanywalksforhealth.com/items/show/157. “About the Rally - One Voice United Rally for Public Education.” NYSUT A Union of Professionals, June 8, 2013. http://www.nysut.org/resources/special-resources-sites/one-voice-united/about-the-rally. “Common Core State Standards Background Information.” NYSED, July 15, 2011. http://www.p12.nysed.gov/ciai/common_core_standards/ccsbackground.html. Strauss, Valerie. “Seven Facts You Should Know about New Common Core Tests - The Washington Post.” The Washington Post, September 4, 2013. https://www.washingtonpost.com/news/answer-sheet/wp/2013/09/04/seven-facts-you-should-know-about-new-common-core-tests/. Phone interview with Kathleen Reid. February 29, 2016.